A couple of items released today. We've added a new widget that allows you connect directly to a Youtube play list without having to add the videos into the Training Tilt platform. This is a great way to easily include regular content like video logs or just videos you want to quickly share with your clients. If you use it for a video log you can upload your videos directly to your Youtube account and add them to the playlist and they will automatically appear in the widget. A few simple steps to get setup. Now login to Training Tilt and add it into the settings. That's it you are all setup. The widget will now display in the same format as your other content widgets. Clicking on any of the items will open the playlist in a new page and display the selected video. We've just added a new notification type. When athletes add a note on their dashboard you'll get an email. Same goes for when a coach adds a note and checks the "visible to athlete" checkbox. 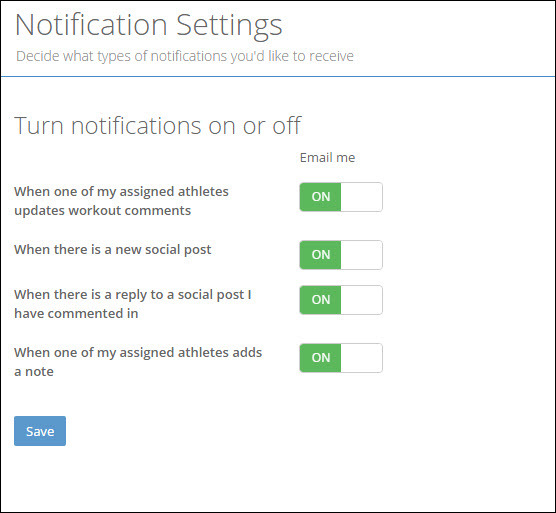 As with the other notifications both coaches and athletes can switch them on or off on the notification settings page.